The IPO went great. You figured out how to stream eternal life over the Internet, and now you’re filthy rich. You’ve got it. You’re going to flaunt it. You’re thinking swank. As a recently annexed province of Silicon Valley, San Francisco is filthy rich. As such, it offers many opportunities to indulge every impulse. 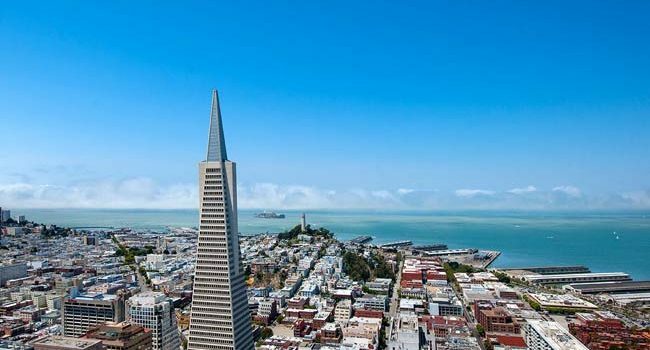 Perishingly few are swankier than the view of San Francisco Bay and the northern precincts of San Francisco itself from room 4405 in the Loews Regency San Francisco Hotel. This was the panorama my wife, Georgina, and I enjoyed on a recent visit. 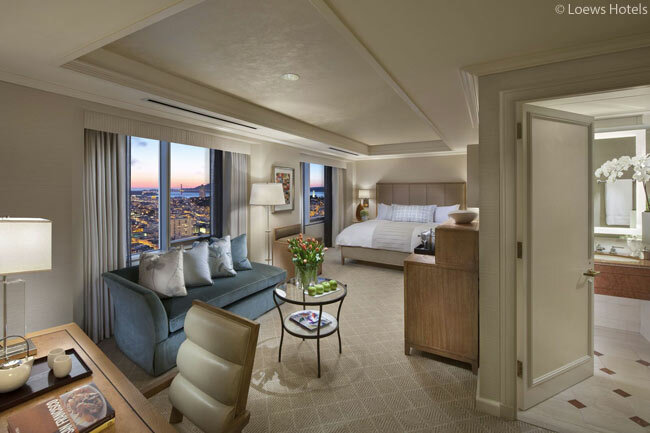 Unlike digital media billionaires, we are not awash in bitcoin wealth, but we were in a celebratory mood, so we booked a Deluxe Bay View King Room. Sitting before the picture window in our room on a clear night, we spied the twinned white spires of the Church of Saints Peter and Paul on Washington Square, along with the slashing diagonal of Columbus Avenue, the thrusting needle point of the Transamerica Pyramid and, off to the west, the illuminated Art Deco magnificence of the Golden Gate Bridge. The India-ink wash of the Pacific was just visible past the great bridge. 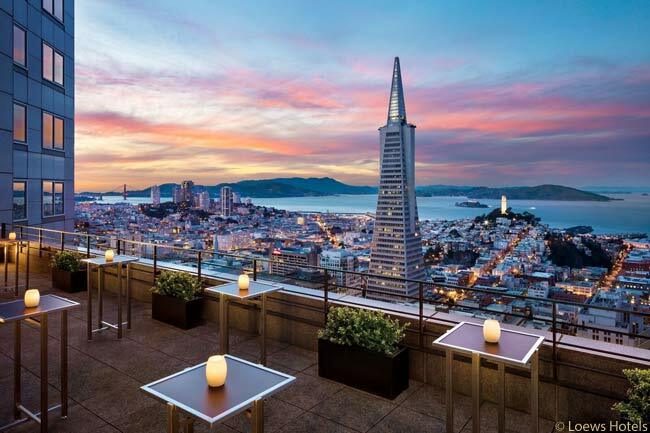 In 2015, New York-based Loews Hotels bought the property – which opened in the early ’80s as a Mandarin Oriental – after the Hong Kong luxury hotel group left San Francisco. 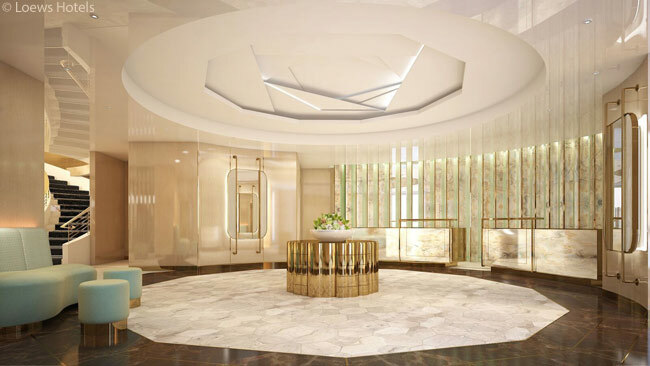 With Asian staffers still amply represented on-property, lingering touches of refined Asian hospitality remain part of the re-flagged hotel’s culture. Admirers of Asian graciousness (I am one) count this as a good thing. Although the 5-star high-rise has a relatively new name, the footprint of the hotel has changed little. Like the Mandarin, Loews Regency occupies the top 11 floors of a 48-story, two-tower building. The 158 guest rooms and suites are accessed via elevators off a fairly compact ground floor lobby. A small lobby bar is situated near the elevators. Closer to reception and the entrance on Sansome Street, Brasserie S&P, where we took breakfast, has since closed and been replaced by The Bear & Monarch. 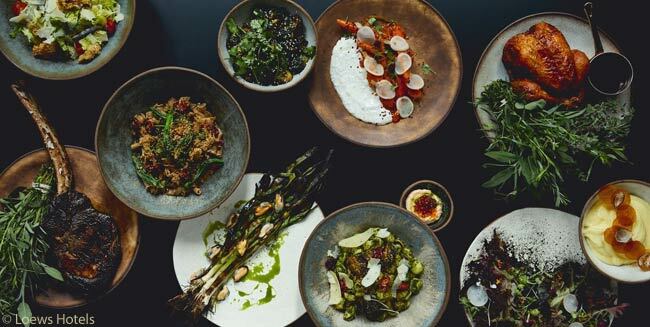 A creation of well-traveled executive chef Howard Ko (Daniels in New York, the Restaurant at Meadowood and the French Laundry, both in Napa Valley), the new eatery is characterized by Ko’s fine-dining sensibility. Located just off the sleek, contemporary lobby, The Bear & Monarch has a willfully rustic-tavern look. In its cuisine Ko has retained some somewhat dated elements such as vertical food creations and abundant use of fennel, which usually I find abundantly flavor-free. He has also, however, featured dishes I am looking forward to trying. Among the latter: grilled squash blossoms filled with shu mai, tobiko (flying fish roe) and Chinese XO sauce, and a 16-ounce New York strip steak dry-aged for 108 days. 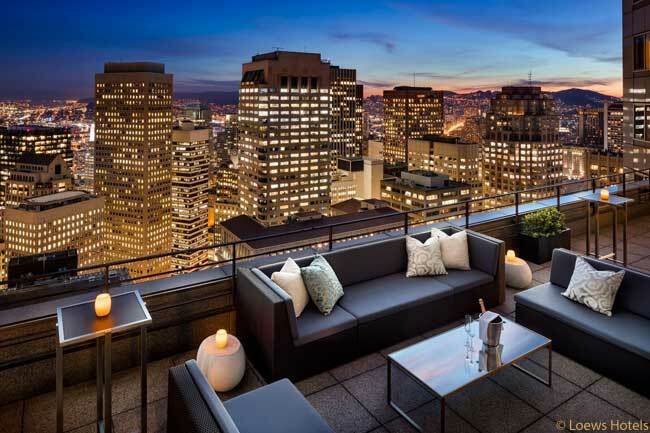 Loews Regency San Francisco – which caters mainly to corporate business travelers – is well-located. 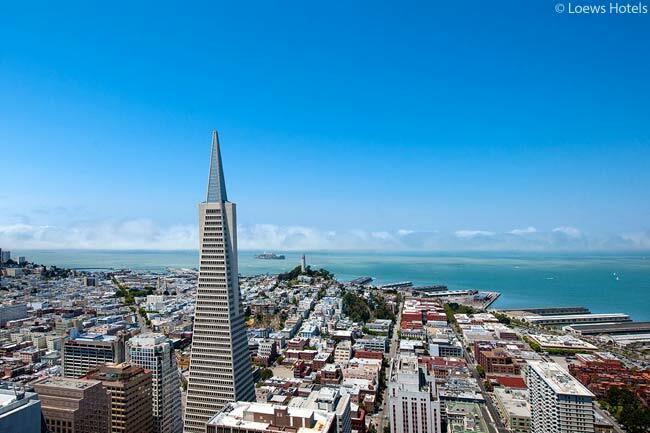 It sits toward the northern edge of San Francisco’s traditional city-center financial district. Shopping destination Union Square is about half a mile west and Moscone Center, the city’s convention and major meetings complex, is about a mile south, just past Market Street, downtown’s main stem. If the weather is fine and schedules allow, you can walk to these places from the hotel. When we weren’t busy being entranced by the sweeping views, flutes filled from a complimentary bottle of Champagne in hand, we busied ourselves poking around our room. 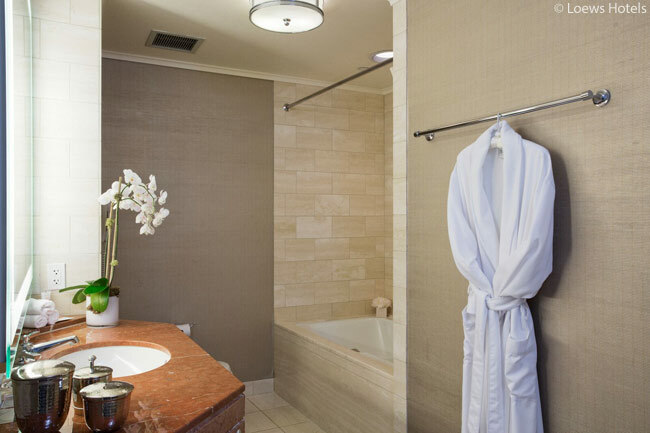 At 575 square feet, the Deluxe Bay View King Room is good-sized for a San Francisco business hotel and very comfortable. The bathroom is equipped with sink, marble tiles, a deep bathtub and a separate shower. I liked the waffled cotton bathrobes. 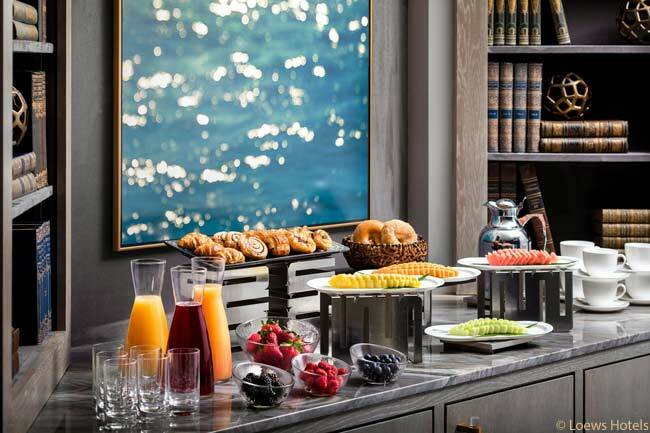 The Loews Regency San Francisco offers more than 5,000 square feet of meeting space for business conferences, receptions, weddings and the like. 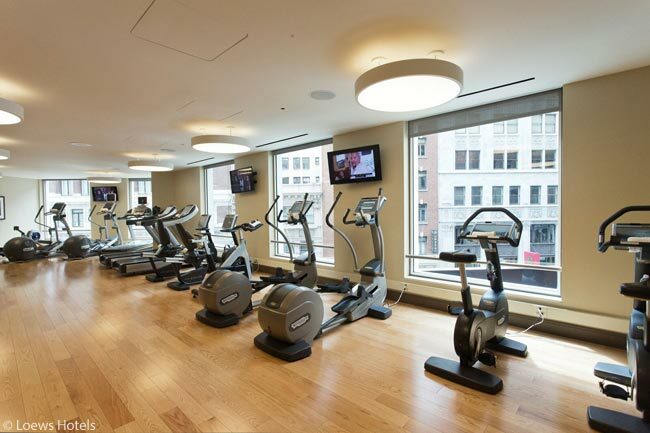 The hotel also boasts a 24-hour spa (which at press time wasn’t in service), coupled with a 24-hour fitness center; between them, some 8,000 square feet on the 3rd floor is dedicated to fitness and wellness. The property also has two PC workstations and printing facilities in a 24-hour business center accessed with a guest card. There is free Wi-Fi throughout the property. Not that the hotel is all business. While we sipped nightcaps in the lobby bar one evening during our four-night stay, an ebullient wedding party enlivened the space. Loews Regency San Francisco is within walking, jogging, cycling, roller-blading, and scooter-riding distance from the city’s eastern waterfront. This is a flat expanse of 19th-century bay-fill that boasts fine water views, bike rental shops, old favorites such as Red’s Java House (a friendly beer and burger joint) and the crown jewel Ferry Building. Renovated in 2001, the Ferry Building – the hub for what was once an extensive network of water ferries – still runs some commuter services on San Francisco Bay. These days, the Ferry Building is best-known as a hub of first-rate restaurants and retail food outlets. Saturday is the best day for shopping, snacking and people-watching. We had lunch at the Slanted Door, Vietnam-born chef Charles Phan’s contemporary Vietnamese restaurant; and then we bought crusty sourdough bread at Acme Bread Bakery and triple-cream Mount Tam cheese at Cowgirl Creamery for later on. Closer to the hotel – practically around the corner – are old-school favorites such as the seafood-oriented Tadich Grill and the new school, free-style dining and drinking spot Wayfare Tavern. On the last day of our stay, Georgina and I had house-made martinis and drank-in the view from Loews Regency’s 40th-floor Sky Deck, a glassy walkway connecting the hotel’s two towers. It was a fine way to cap a pricey but deeply enjoyable stay. I was reminded of these words from Mark Twain: “I have always been rather better treated in San Francisco than I actually deserved.” As usual, Twain said it best. 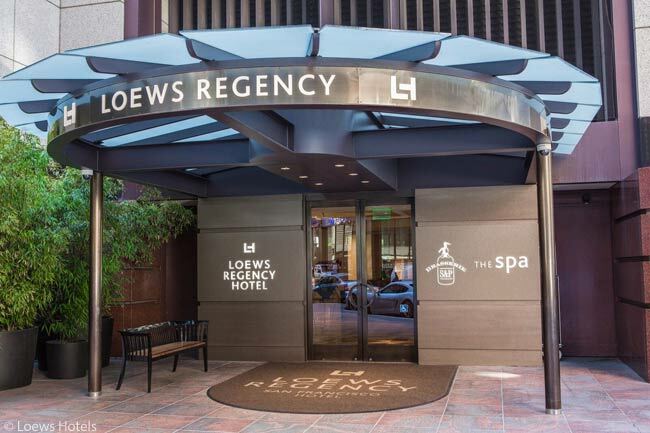 The Loews Regency San Francisco Hotel is located at 222 Sansome Street, San Francisco, CA 94104. We paid US $469 per night for our Deluxe Bay View King Room. The hotel has a variety of rates on offer, some lower than what we paid, especially in off-season periods and during special promotions. For reservations, go to www.loewshotels.com/regency-san-francisco or call toll-free at 855.757.2364; the hotel switchboard’s phone number is +1 415.276.9888.